Thousands of parents scrambled for alternate ways to get their children to school and back home Wednesday as the school bus drivers union went on strike amid a dispute over job protections in new contracts. Some 152,000 New York City schoolchildren -- or about 14 percent of the public school population -- take the bus. About 54,000 of them have disabilities and face extra hardships traveling to school. Attendance on Wednesday was down 2.5 percent overall and as much as 34 percent among the special education population compared to the rest of the month average, officials said. 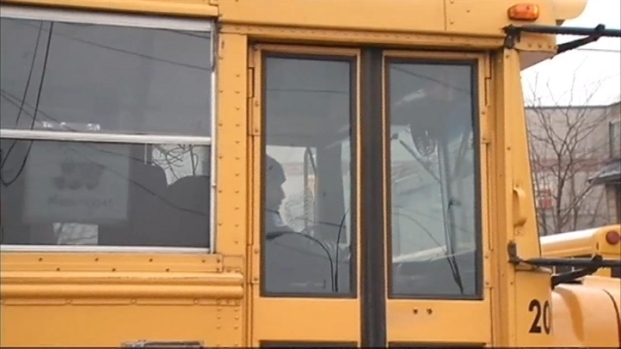 Officials said about 3,000 of 7,700 routes, or 39 percent, were running Wednesday, including 100 percent of pre-kindergarten routes and 39 percent of special education routes. Not all the city's school bus routes are driven by the striking union. More than 100 bus drivers reported to picket lines in Queens Wednesday morning in the city's first school bus strike in more than three decades. The union promised the strike would go on until workers were guaranteed job protections in new contract bids. Some families breathed a sigh of relief when their regular school buses showed up Wednesday morning. Pei-Sze Cheng reports. "Mayor Bloomberg, Chancellor Walcott, please come negotiate with us," Union President Michael Cordiello, president of Local 1181 of the Amalgamated Transit Union, said Wednesday. "Protect the workers that have the experience, protect the children in New York. You can do it. Please, come forward and end this strike. It's in your hands." 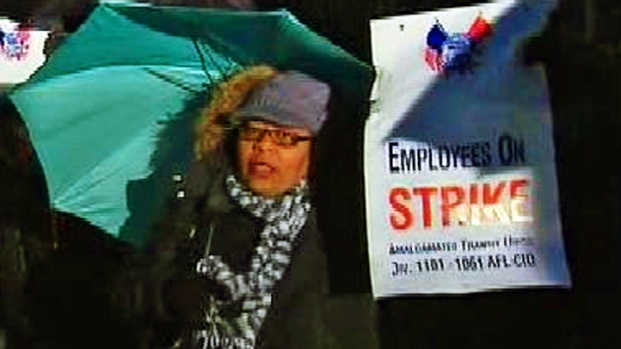 Solange Roche, a bus driver in Ridgewood for 23 years, held an "Employees on Strike" sign in one hand and an umbrella in the other as she stood in the rain with other union members at the picket lines in Queens. "We need job protection," said Roche, who is among the more than 8,000 school bus drivers and matrons on strike. She and the other union members fear they'll lose their jobs to cheaper alternatives when their contracts are up in June. Roche said she'll be in the picket lines for "as long as it takes" to reach a deal that satisfies the union's demands. Bloomberg said police were called to a few garages in Brooklyn and Staten Island after picketers sought to block buses being driven by non-striking drivers. Police said there were no arrests and that the picketers mostly complied with requests to step aside. Striking Bus Driver: "We Need Job Protection"
School bus driver Solange Roche was among the hundred union members who reported to picket lines in Queens as 8,800 members of the powerful union went on strike early Wednesday. Members of the United Federation of Teachers were also on hand to show their support. The union and the city have been battling over how new contracts are being drawn up for a set of bus routes. The city wants to cut transportation costs and has put about 1,100 bus contracts with private bus companies up for bid. The union is decrying the lack of Employee Protection Provisions, saying without the so-called EPPs, current drivers could suddenly lose their jobs once their contracts are up in June. Just after the strike officially began, Schools Chancellor Dennis Walcott reiterated to NBC 4 New York what Bloomberg had said Monday -- that the union wants job protections the city cannot legally provide under competitive bidding regulations. Cordiello has said that claim is inaccurate, and said the strike would continue "until the mayor works with us to put the EPP back in the bid." Walcott said he understood the additional stress the strike would place on families, but said the city's hands were tied on the matter. "We're putting a bid out to make sure we get the best service for our students. We have a responsibility to the taxpayers to put in a request for bids," Walcott told NBC 4 New York. "We will never compromise the safety of our students, plain and simple. We know it's going to be tough for our parents and children." The city began taking measures this week to alleviate additional hardships imposed by the strike, including passing out free MetroCards for children to take mass transit to get to school. Walcott said the MetroCards for children are active Wednesday, while parents or guardians of students will have access to free MetroCards Thursday. In the meantime, they would be reimbursed 55 cents per mile for transportation. The free city subway or bus passes were not much of a solution for many families. Schools Chancellor Dennis Walcott talks to NBC 4 New York about the labor dispute that has bus drivers union members on strike and the city's plans to ease the additional hardships it will put on New York City families. Grandmother Janet Balmes said it's ridiculous to expect her 5-year-old grandson would take a city bus to school. "I don't let him walk to the corner by himself. I'm gonna put him on a city bus to go to school? I'm gonna let him get off, cross the street and go to school? Not in this lifetime," Balmes said. In Queens, mom Miriam Aristy-Farer volunteered to walk children from the A train to their school -- her contribution to ease the collective pain that parents will experience Wednesday. "It's putting the pressure on people who don't make a lot of money to begin with, and asking parents to choose between safety and money," she said. Some were concerned a prolonged strike could affect their livelihoods. 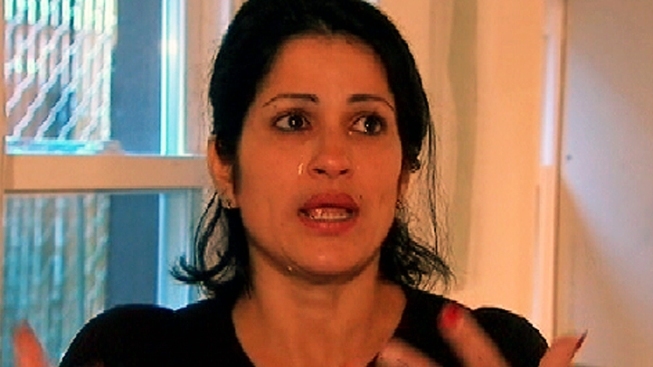 Angela Peralta of Staten Island has two daughters who take buses to two different schools. She's made car pool arrangements for one daughter and will drive the other one herself. That means she'll have to leave work early to pick her daughter up. NBC 4 New York's Marc Santia talks to parents still struggling to get on their feet after Sandy, who are now worrying about how to get their children to school on Wednesday morning. "I hope this doesn't go on very long," Peralta said. "I'm afraid that one of these days I'm going to walk into work and they're going to say, 'You know Angela, enough is enough.'"